A guide to: Awareness, Exposure risks, and Treatment. In November of 2013 we received Ohio Grant funding and funding from the city of South Euclid to purchase two state of the art patient transport devices called the Stryker Power-Load cot system by Stryker. This new loading system has become the norm in our geographical area and will allow for the safer transferring of the patient with the added benefit of reducing or eliminating lifting injuries of our personnel, where nationally 40% of firefighter injuries are back and lifting related. 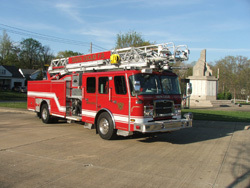 All of the members of the South Euclid Fire Department welcome you to our website. Our department has a long & proud history of service to our community, and we hope this site will continue that tradition. Please check back frequently for new information about local safety concerns as well as new programs or services being provided by the South Euclid Fire Department. Firefighters do more than just fight fires. South Euclid firefighters provide emergency medical service, conduct fire safety education, maintain and repair equipment, inspect fire hydrants and conduct fire safety inspections. Officers are available, upon request, to speak to school, civic and religious groups about fire prevention and safety. Firefighters teach various fire safety, first aid and fire prevention courses to many groups in the community.